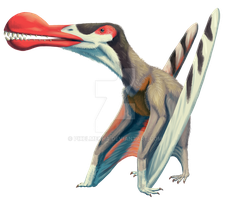 Finally got around to painting my Zbrush model of Anhanguera. I have a huge backlog of unfinished work built up. Some of them have been posted around on my various portfolio sites but most of them have not been seen by anyone. I'm going to be working on finishing these projects up and getting them online. The majority of them are paleo-reconstructions of some kind. Wow that is seriously cool! The colour scheme reminds me of WWD designs. Pardon my ignorance but what is WWD? Ahhh cool. I haven't heard it called WWD before. Good to know and thank you.